Earlier on this year, Walkers had something of a hiccup in their social media campaign. The idea was to get the public to send in a picture of themselves, and then the Walkers Twitter account would automatically post a video clip with Gary Lineker holding a frame containing that picture. It was a good idea until, sadly, mischievous Twitter users were able to exploit the automated function of the campaign. Perhaps automated social media isn’t the answer? What Walkers didn’t consider was the fact that, when you set up an automated system, there will always be ways to manipulate it. In this case, people were able to upload pictures of whoever they wanted (Stalin was one example – the rest I leave to your imagination). The pranks made it into the news and left Walkers with a campaign that thoroughly backfired. While having a social media automation strategy can be beneficial when there is no one available to handle it in real time, an actual person to monitor your social accounts and handle the curation of content is the most effective way to grow your social media following and increase your web visibility. When it comes to having an effective online presence, content curation is key. Regular updates to your accounts will keep audiences interested and expand your digital presence. When the content is original and linking to the brand’s website, it will have a positive effect on its Search Engine Optimisation (SEO). As long as your links are not misleading and offer content that can benefit the reader, a business can make its way up the Search Engine Results Page (SERP) in no time. An agency like ours has someone who actively searches for content that is both relevant and up to date, tailored to the brand’s voice and industry. It can be difficult to determine what kind of content will be the most well-received, which is why having a professional test out different types of content and identify a niche audience is very useful. Also, publishing content from another source shows that a brand knows its industry and is not afraid of potential competition, a level of insight you can’t replicate with a bot. Automation does have its uses, however, such as the scheduling of posts to make sure they have the most eyes on them upon publishing, or the maintenance of your online presence even when the team is offline. Although not even this level of automation should be unsupervised, as evidenced by a gig promoter who tweeted that fans should share their pictures of the gig only an hour or so after the gig was cancelled due to the stage collapsing and a fatality. But automated direct messages are best avoided because they can ruin engagement. Auto-generated replies can lead to a timeline full of the same, obviously non-personalised replies, which dehumanises your brand, as Bank of America found out. Automatically sharing or curating content without anyone reading it first can also lead to some disastrous results and could completely alter the public perception of your brand. Some brands try to use automation that will give them some variety in their posts. 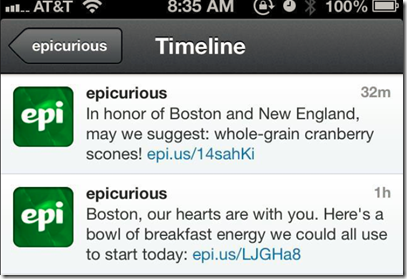 Epicurious used what seemed to be a system that would automatically look for trends to piggyback onto in order to get the most exposure. This backfired spectacularly when they sent two highly inappropriate tweets just after the Boston bombing. Contrastingly, a social media manager would keep track of breaking news and review any scheduled posts for content that might be inappropriate. At Dusted, we understand that some businesses prefer to keep social interactions to themselves, which is why we usually tailor our social media services to your preference. We manage social accounts in their entirety, but can also take charge of curated posts and influencer research to leave you to interact directly with your audience. This will keep your social accounts active and your followers growing, while also ensuring that the company is properly represented throughout social engagements. Our key objective is not to engage with your audience, but to facilitate the expansion of your audience and the introduction to key influencers. Feel free to contact us if you’re interested to find out more.